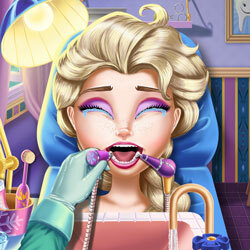 Ice Queen Dentist Job is a cool didigame for girls. The ice queen has a toothache and it`s because she has a cavity, rush to the dentist office and your job is to help her out. Do a regular check-up to see which tooth is the real problem, then try treat it with professional equipment. She might get a little nervous, but her boyfriend will be right there to calm her down so you can complete the treatment. Play this dental game and other HTML5 games online free or on your mobile phone and tablet.